13: Rosslyn Aero Modellers Fly-Inn. 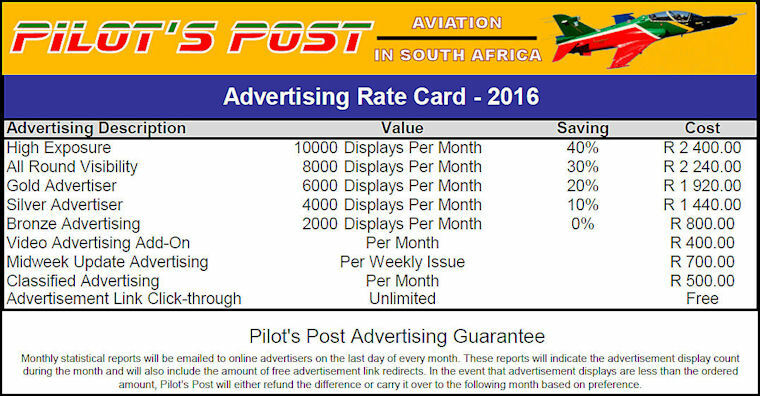 Landing fee of R100.00 will be payable on arrival by the pilots. Hot-dogs and cool drinks will be available. No flying without a valid SAMAA card. Contact Ina Van Der Merwe at fullstop@mweb.co.za for any inquiries. 14: Aero Club's 75th AGM 14th of April 2016 at 18:30 at the Harvard Conference Centre at Rand Airport,Germiston. 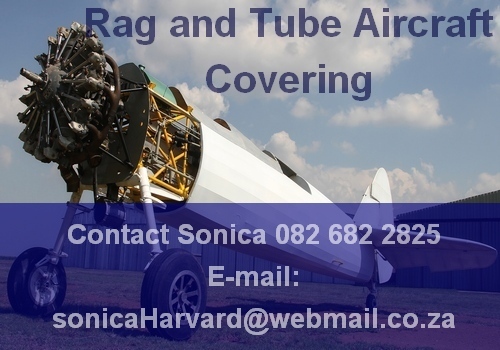 RSVP Sandra Strydom on e-mail to office@aeroclub.org.za. 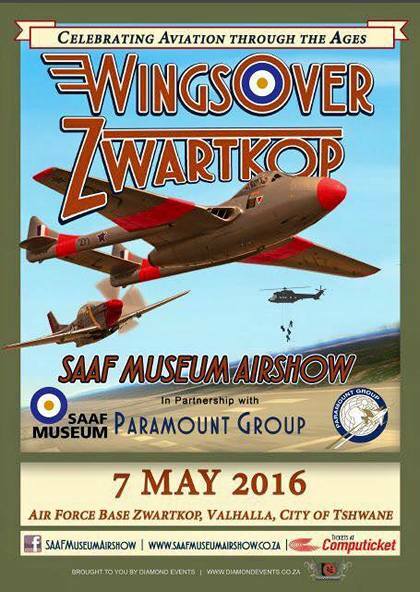 23 April-1 May: Kroon Microlighters South Coast Fying 2016 - Annual Margate trip. 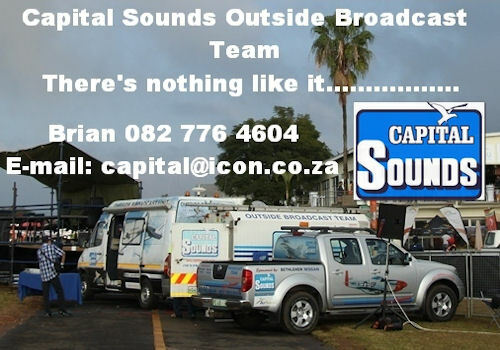 Contact Dawie (082 576 2355) or Pierre 078 119 0949) for more info. 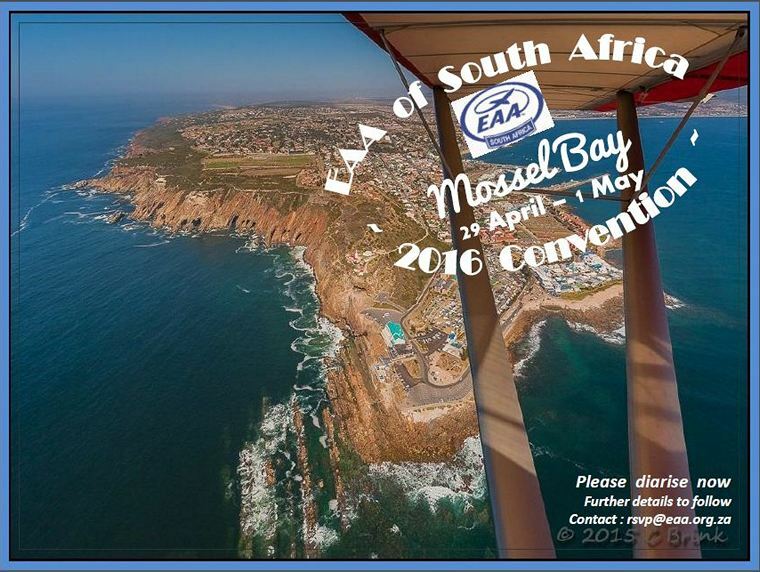 30: The MISASA Western Cape fly-in at Mossel Bay on the 30th April piggybacks on the EAA convention being held over the long weekend. 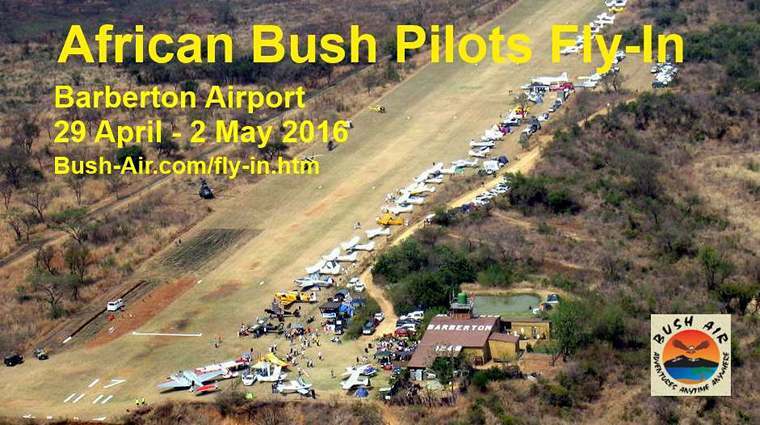 29 April-2May: Bush Air - Fly-In Barberton Airport, South Africa. 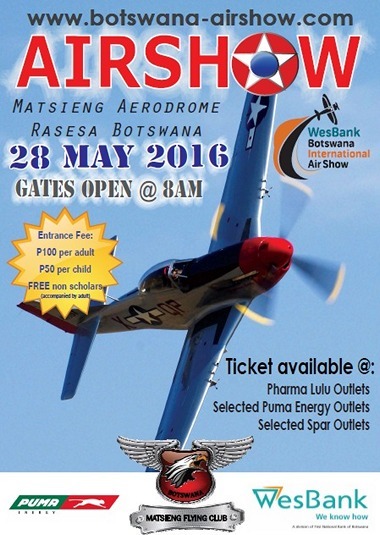 No airshow and no public will be allowed in. There will be fun activities and competitions during the day such as spot landing, stol, ribbon cutting etc. The rest of the time it will be a big fat party! Fly-in and camp with your plane. An attendance fee of R2000 per person will include all your food (breakfast, lunch and dinner) as well as all drinks (Alcohol included) for the entire 3 day weekend. Payment info and to download registration and indemnity forms, go to web page: Deadline for all registrations will be Monday 25 April 2016. 17-28: Sky Grand Prix. 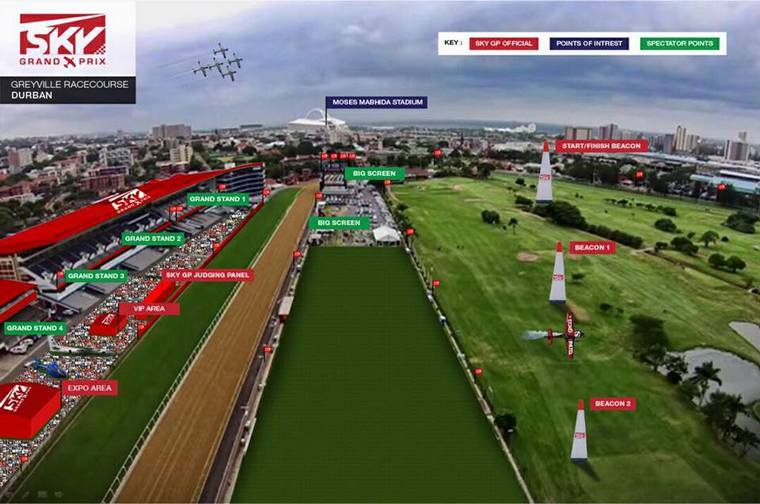 Greyville Racecourse, Durban. Details to follow. 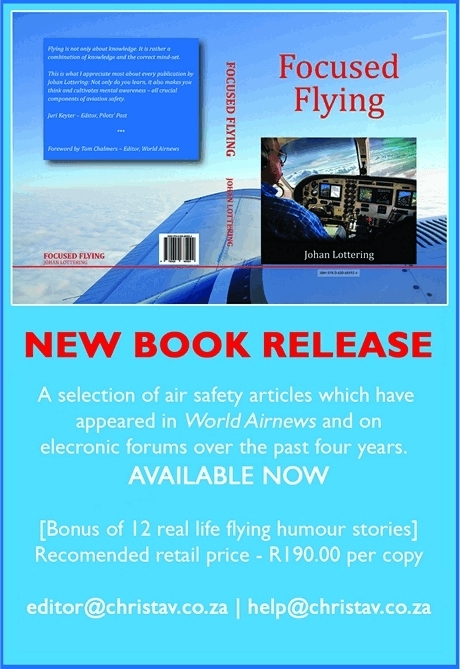 20 - 22: Vryheid Wings Club Fly Inn. First 10 pilots who fly in on Friday and also on the Saturday will get free food and drinks for the whole weekend (pilots' only not entire crew). All other pilots and crew will be charged R 600 for entire weekend and R 450 from the Saturday and Sunday only (fly inn day only R150). Thanks for being patient; entries to the 2016 President's Trophy Air Race are now open on our website. PTAR 2016 is set to break records yet again! Last year in Bloemfontein the SAPFA team managed to get the results out before sunset on both days which was an all time first. Also we managed to get through the prize-giving and awards evening by 9.30 in the evening (also a first ever) which gave us time to relax, socialise and have fun at the end of a great weekend. This first of this year's records is the fact that the new improved handicaps have already been published and are on the SAPFA website right now which is a full 12 weeks before the event. Both the SAPFA and the Bethlehem Aero Club committees are busy with their fuelling and pre flight checks and will be ready to line 100 aircraft up on Friday 27th May. Those who know Bethlehem and its surrounds will understand why it is going to be such a great venue. The infrastructure and airfield are superb and the terrain over which we will fly is going to be easy enough without making it simple. It is a beautiful part of the country and, coupled with the Bethlehem hospitality, we doubt whether a better weekend could be had anywhere. You as a PTAR veteran will know that the Race is run on a handicap basis where each and every aircraft, regardless of age, type, race colour or creed, will have its own private and special handicap. This basically means that, if you happen to have a 182 for example, that was built on a Friday the 13th back in 1968, that flies slower than any other 182 ever, you will receive a handicap that suits your aircraft and have a reasonable chance of winning. This is provided, of course, you fly properly. Now, already I can hear the gnashing of teeth and the low groans coming from the oldies who have been at loggerheads with the handicappers since 1937. Well we have found the miracle cure that goes by the name GPS Logger. This little electronic device started out in a very simple form that was used as a backup to the manual system that had been in place forever. The organisers of the Race very quickly discovered just how powerful this little piece of equipment was and started to use it more and more to the point where we now have Race data on about 260 aircraft going back 7 years. It is extremely important to remember that Race entries are limited to 100 only and we would suggest that you get your entry in as soon as possible to guarantee a spot in the running of the President's Trophy Air Race 2016. Boeing [NYSE: BA] and the Paramount Group, the South Africa-based global defense and aerospace business, have expanded their 2014 agreement to cooperate on an advanced mission system for a variant of the Advanced, High Performance, Reconnaissance, Light Aircraft (AHRLAC). A high-wing, two-seat aircraft, AHRLAC is designed to incorporate advanced intelligence, surveillance and reconnaissance (ISR) capabilities and weapons systems. Boeing will develop an integrated mission system for the aircraft enabling ISR and light strike missions for the AHRLAC safety & security, and military variants. This militarised version will be known as Mwari. Speaking from the Global Aerospace Summit in Abu Dhabi, Jeffrey Johnson, vice president, Business Development, Boeing Military Aircraft, said, "Through AHRLAC, we'll not only bring a flexible, persistent and affordable aircraft to the international market, but we'll also be developing world-class technology in Africa." "Our relationship with Paramount will help us access markets that are new to Boeing," Johnson added. Air Traffic and Navigation Services SOC Limited (ATNS), the air navigation service provider of South Africa, has selected Thales to supply, install and commission Wide Area Multilateration (WAM) surveillance, Primary and Secondary Surveillance Radars, and Distance Measuring Equipment (DME) technology to a number of its sites. These contracts are part of the country's continuing efforts to modernise navigation and surveillance capabilities, ensuring a significant improvement to safety and efficiency. Over the past decade, African air traffic has increased exponentially, with South Africa being one of the busiest airspaces in the continent. As a result, improved air space management, advanced technologies and system modernisation, Thales is supplying a WAM system to the Northern Region of South Africa and Distance Measuring Equipment (DME) technology to 31 sites across the country. ATNS has commissioned Thales to deploy multiple surveillance technologies, including WAM, Star NG (Next Generation) Primary Radars and RSM 970 Secondary Radars, matching the best solution to the operational requirement. The WAM system will be deployed to provide surveillance over the entire Northern region. Radars will be deployed to Johannesburg O.R. Tambo International Airport, Cape Town, Durban and Blesberg sites. These surveillance systems will be integrated into ATNS's existing Thales TopSky Air Traffic Management System, providing cost-effective, scalable and reliable surveillance. DME systems will be deployed to 31 sites across South Africa where they will ensure high accuracy en-route and terminal aircraft guidance. Together, these technologies will improve ATNS' capability to offer airlines RNAV routes for faster and shorter trajectories, lower fuel consumption, and reduced carbon emissions. Further, in addition to the supply, install and commission of the technologies, these contracts provide for a long term support and maintenance agreement. "In line with ATNS's Shareholder Mandate to deliver safe skies and customer centric services, technology is a central service enabler. To this end, ATNS has invested in the acquisition of new and advanced technology for Air Traffic Management to replace the current national Air Traffic Management Automation system. Through this programme, ATNS will enter a new era of operational technology advancement for the benefit of the ATM community. The South African aviation infrastructure is considered to be one of the best in the world, contributing to the country's aviation safety record. It is, therefore, imperative that we continue to invest wisely in this infrastructure to support the country's overall transport infrastructure". Thabani Mthiyane, CEO, ATNS stated. 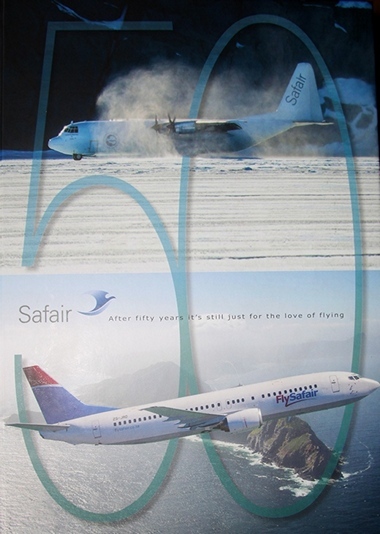 In the January the St Helena Airport Authority reported that Basil Read was taking part in a further round of desktop audits with the regulator, Air Safety Support International (ASSI). These were completed at the end of January 2016. Basil Read has now progressed to the final round of desktop audits which are taking place this week. Pending the outcome of these desktop audits the next step is an on-site audit by ASSI. This is provisionally scheduled for early April 2016, but the exact timing is dependent on any corrective action required following the desktop audits. In the meantime, all parties involved in the Airport Project are focused on ensuring that all the necessary procedures are implemented in good time to ensure the safety and security of our airport. Personnel continue to undergo training to ensure that they are ready to commence the operations phase. The target date for the official opening of St Helena Airport remains Saturday 21 May 2016 - with airport operations to commence prior to this. Alan Shaw arrived on St Helena on Monday 4 January 2016, as the Interim Accountable Manager & Certification Manager for St Helena Airport. During his time on-Island, Alan worked to progress various elements needed to achieve certification with ASSI. 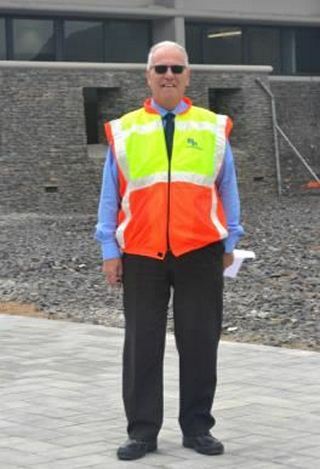 He delivered training courses on Airport Operations, including aerodrome licensing, health & safety, airside safety, and declared distances to airport staff, Basil Read and St Helena Government. Alan has spent 50 years in aviation, with 23 years in the field of operational air traffic management. His career has covered air traffic, fuelling operations, operational regulatory requirements, airport security, rescue & fire fighting, security, safeguarding, and terminal building services. He has also advised UK aviation authorities and the states of Jersey and the Channel Islands. Alan has also served as Head of Operations at Leeds Bradford International Airport in the UK. His experience of international airports includes being the safety management and training advisor to the Iraq Civil Aviation Authority based in Baghdad. Less expensive than most light sport aircraft, the Rans S-20LS Raven (for light sport) tailwheel aircraft with side-by-side seating for two that started life as a kitplane has FAA approval as a factory-built aircraft. Pilots who fly the $119,000 bush-capable airplane can do so with only a driver's license. It comes in a variety of horsepower, from 60 through 180, and offers a selection of avionics from traditional analog to Dynon and Garmin glass panels. The engines available to buyers are the Lycoming O-233; Titan O-340; and Rotax 912ULS, 912iS, 914, and when available, the 135-horsepower Rotax 915. Light Sport category aircraft are limited to two people and a top cruise speed of 120 knots true airspeed with a fixed-pitch propeller. 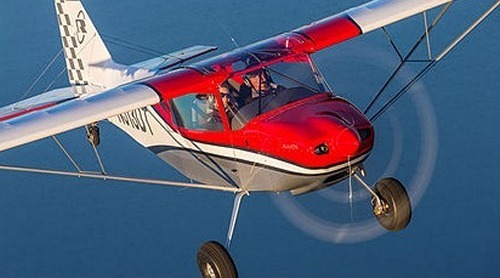 FAA approval of the S-20LS as a light sport aircraft had been expected last year. The S-20LS first shipped from the factory in Hays, Kansas, 2.5 hours west of Wichita, as a kit aircraft. Rans currently offers seven designs as kits. There are four light sport models: the Raven, S-6LS Coyote II, the S-7LS Courier, and the S-19LS Venterra. The low-wing Venterra has been tricked out with leather seats and luxury interior. 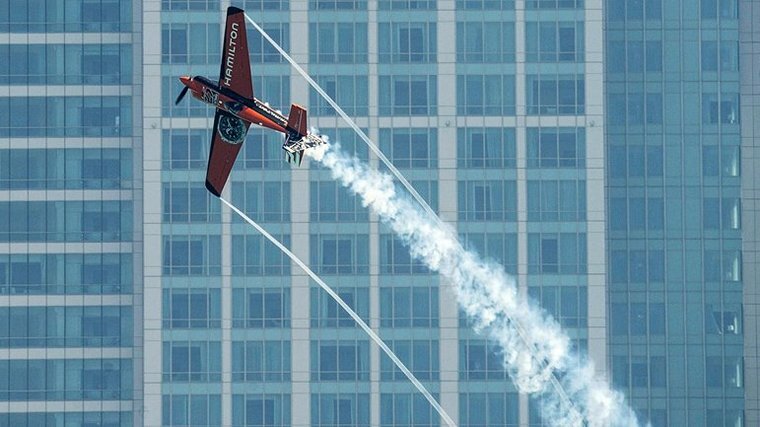 The first race of the 2016 Red Bull Air Race World Championship was even hotter than expected in sizzling Abu Dhabi on Saturday, as France's Nicolas Ivanoff blazed through the pylons to victory in a close and frequently astonishing competition. Claiming the early lead in what's setting up to be an especially fierce title battle, Ivanoff's time of 58.550 was barely a tenth of a second faster than Matthias Dolderer of Germany in second place (58.660). François Le Vot of France, who is beginning only his second season and was ranked 14th in 2015, captured his first career podium with 1:02.281 for third place. 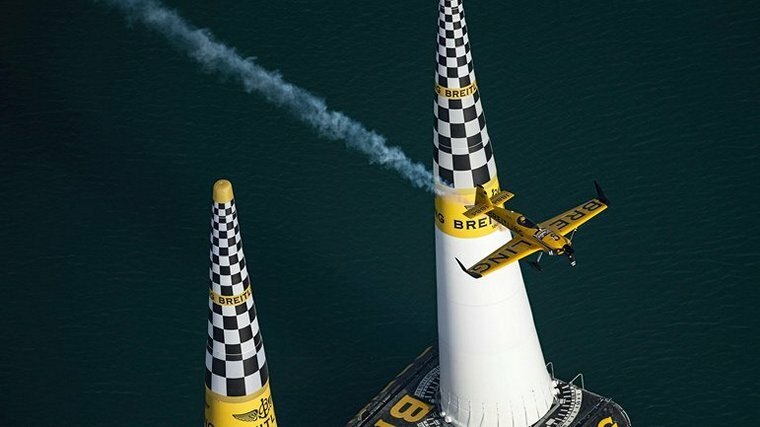 With the retirement of 2015 World Champion Paul Bonhomme, the 2016 title for the world's ultimate motorsport series in the sky is anyone's to seize, and the heat was on. The day was packed with shocks: Matt Hall of Australia, who was ranked number one after finishing second overall last year, hit a pylon and failed to advance beyond the opening round for only the third time in his career. Another top favorite, 2008 World Champion Hannes Arch, gave fans a similar surprise after flying brilliantly through the early rounds only to earn a disqualification in the Final 4 for passing the Safety Line. Arch finishes the race in Abu Dhabi without any points, due to his DQ result. The season-opening victory makes Ivanoff the early leader in the points as the campaign for the World Championship begins across seven more races in six countries. "I propose we end the season right now," joked the Team Hamilton pilot. "Actually, we worked really hard for this in training and I was not stressed coming into the race - but I knew we had to be really careful. I'm very happy for my team and my fans." 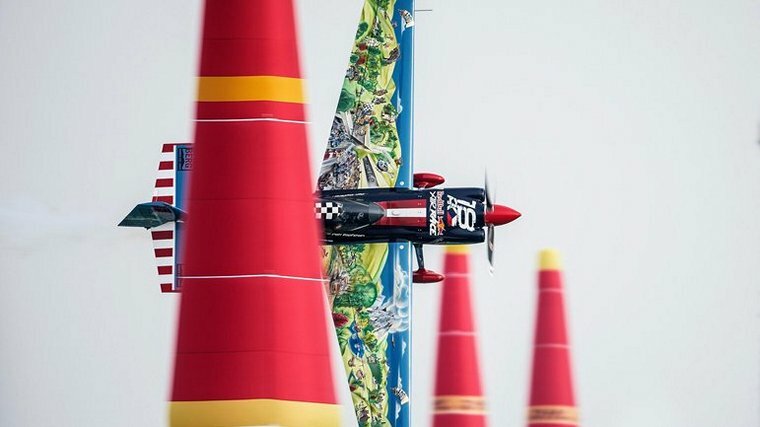 Tickets for all stops of the 2016 Red Bull Air Race World Championship - including the next race in Spielberg, Austria on 23-24 April - are on sale now. Bombardier Commercial Aircraft announced that it has commenced CS100 aircraft route-proving exercises in Europe. The month-long program is underway with a dedicated CS100 route-proving aircraft operated by Bombardier from launch operator Swiss International Air Lines' ("SWISS") base in Zurich, Switzerland. The route-proving exercises are scheduled to include main European cities such a Brussels, Vienna and Warsaw. Additionally, Bombardier also confirmed that the last of eight flight test vehicles - the second CS300 aircraft - successfully entered the flight test program in Mirabel, Québec last week. The European route-proving program is being conducted as SWISS readies for the CS100 aircraft's entry-into-service (EIS). The airline's first CS100 aircraft is scheduled to be delivered by Bombardier in Q2 2016. "As the launch customer and the first airline that will operate the CS100 aircraft, the European route- proving program is very important to us and will provide a real indication of how the aircraft will operate in our network when we take delivery of our first CS100 aircraft in the next few months," said Peter Wojahn, Chief Technical Officer, Swiss International Air Lines. "The CS100 aircraft continues to attract curiosity and keen interest when visiting airports around the world and now, it will be spotted in cities across SWISS' network -- performing as if already a member of the airline's fleet," said Fred Cromer, President, Bombardier Commercial Aircraft. "It's an exciting time as we look forward to these flights and to the close collaboration with our friends at SWISS -- together we are preparing for the C Series aircraft's entry-into-service. The route-proving flights will bring the C Series aircraft closer to the flying public in Europe who will ultimately be amongst the first in the world to fly aboard the aircraft - the first all-new airliner built for the 100- to 150-seat market in close to three decades." The CS100 aircraft will conduct route-proving flights using typical airline flight routings and operational procedures. The flights give a really good indication of how the C Series aircraft will perform in a typical airline schedule to and from different airports. Airfield performance, landings, airport turnarounds and on-ground operations are some of the important characteristics that will be observed. The European route-proving program follows one conducted last year across North America that included more than 35 cities. India's largest airline by passenger numbers, IndiGo has taken delivery of its first A320neo. The delivery makes IndiGo the first A320neo operator in India and in Asia. "The A320neo aircraft will enable us to continue to offer affordable air transportation and a new flying experience for our customers. The fuel efficient aircraft will be part of a new phase of our growth and will enable us to offer more regional and international destinations at the best price," said Aditya Ghosh, President of IndiGo. IndiGo is one of Airbus' biggest A320 Family customers having ordered 530 aircraft in total. These include 430 A320neo from orders placed in 2015 (250 A320neo) and 2011 (180 A32neo). IndiGo also placed an order in 2005 for 100 A320s which have all been delivered. "It fills us with pride that IndiGo, India's largest airline and the biggest customer for our A320neo, has taken delivery of its first aircraft. On top of best in class operational efficiencies and environmental benefits, the A320neo will offer IndiGo's passengers unmatched comfort," said Dr. Kiran Rao, Airbus EVP Strategy and Marketing. The A320neo "new engine option" incorporates many innovations, including latest generation engines and large Sharklet wing-tip devices, which together deliver 15 percent in fuel savings from day one and 20 per cent by 2020. This is equivalent to a reduction of 5,000 tonnes of CO2 per aircraft per year. The A320 Family is the world's best-selling single aisle product line with nearly 12,500 orders to date and over 6,900 aircraft delivered to 300 customers and operators worldwide. Thanks to its widest cabin, all members of the A320 Family offer the industry's best level of comfort in all classes and Airbus' 18" wide seats in economy as standard. Bengal, Dhaka: A cargo Antonov 26B aircraft crashed soon after take-off into the Bay of Bengal near the sea around half a kilometre off the shoreline of the resort town of Cox's Bazar. The pilot reported shortly before the crash that one of the two engines was out of order and that they were preparing to return to the airport for an emergency landing. Fishermen in the vicinity offered assistance recovering the body of the flight engineer who succumb to his injuries. The navigator survived and is hospitalised with critical wounds. However, the pilot and co-pilot were at the time of publication still missing. USA, Los Angeles: a Los Angeles-bound plane turned into a mid-air after a brawl on board over a noisy boom box. Two women who were obviously intoxicated had a boom box on board blasting music to the annoyance of some other passengers who complained, the woman responded by turning the volume up and waving the boom box around. A scuffle broke out when another group of passengers approach them and complained. USA, Santiago: Rock band Iron Maiden's newly-customised Boeing 747-400 has been extensively damaged in a ground-towing accident in Santiago. The aircraft has been transporting the group's members and its equipment for an extensive tour, which was covering Latin American cities in March. It had arrived at Santiago for a concert on 11 March where it was hitched to a tug to be towed for refuelling. Steering failed during a turn and the aircraft collided with the tractor, it adds, badly damaging the nacelles and inlet cowls of both left-hand General Electric CF6 power plants, as well as its undercarriage. Two operators of the tractor were hospitalised as a result of the accident. None of the band members or their crew was on board. USA, Los Angeles: Two Muslim women were removed from a plane in Las Angeles, for allegedly filming in-flight safety procedures, sparking controversy. A passenger on the Jet Blue flight from Boston to LA who witnessed the incident however claimed the two were removed after a flight attendant "casually relayed to a co-worker that she didn't appreciate being stared at. However, JetBlue insisted the women had been removed due to genuine security concerns. "Our crewmembers' first priority is the safe and secure operation of our flights, and as a security precaution, is asked to be aware of anyone who may be filming or taking photographs of inflight procedures or the flight deck area." Bolivia, Santa Ana de Yacuma: A Cessna 206 aircraft crashed into a market in the town of Santa Ana de Yacuma, Bolivia. The aircraft burst into flames at impact killing four on board as well three on the ground. No further information was available at the time of publication. 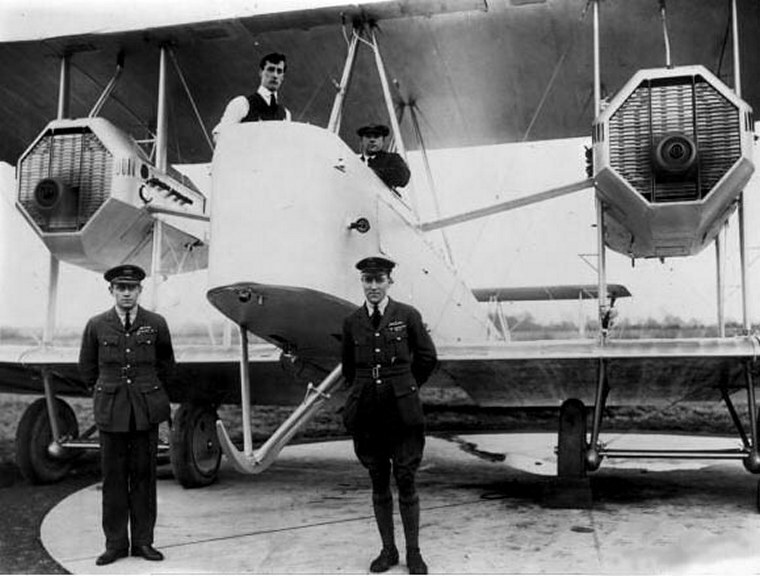 Brand and van Ryneveld in front of the Vickers Vimy "Silver Queen"
In 1920, Lieutenant Colonel (later General) Pierre van Ryneveld and Major (later Air vice Marshal) Quintin Brand attempted to make the first England to South Africa flight. 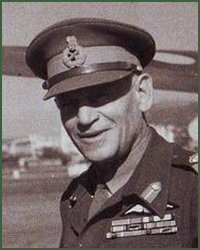 General Sir Hesperus Andrias van Ryneveld KBE CB DSO MC (2 May 1891 - 2 December 1972), known as Pierre van Ryneveld was the founding commander of the South African Air Force (SAAF). He began his military career in World War I, in which he served in the Royal Flying Corps (later Royal Air Force), where he distinguished himself as a fighter ace. 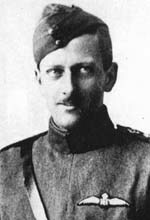 After the war, van Ryneveld was called back to South Africa by the Prime Minister Jan Smuts in order to set up the SAAF. Air Vice Marshal Sir Christopher Joseph Quintin Brand KBE, DSO, MC, DFC (25 May 1893 - 7 March 1968) Brand was born in Beaconsfield (now part of Kimberley, Northern Cape), in South Africa. During the years 1914-1915 Brand served in the Union Defence Force. In 1915, Brand travelled to England where he transferred to the Royal Flying Corps. During the First World War, he flew Nieuport 17 scouts, serving in No. 1 Squadron RFC in France as a Flight Commander. The two left Brooklands on 4 February 1920 in the Vimy G-UABA named Silver Queen. They landed safely at Heliopolis, but as they continued the flight to Wadi Halfa they were forced to land due to engine overheating with 80 miles (130 km) still to go. 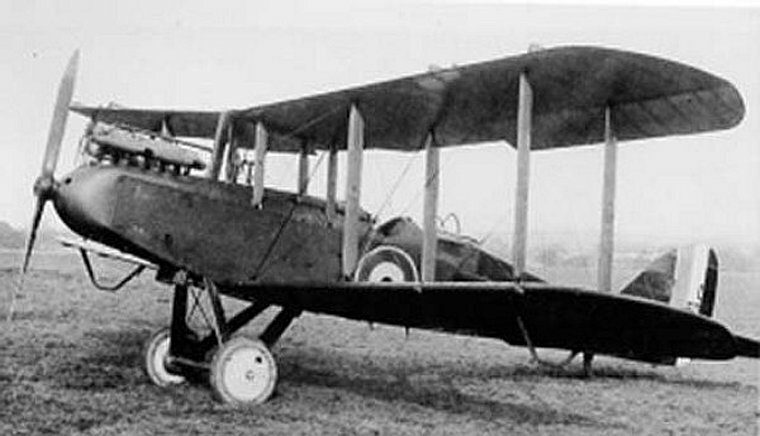 A second Vimy was lent to the pair by the RAF at Heliopolis (and named Silver Queen II). This second aircraft continued to Bulawayo in Southern Rhodesia where it was badly damaged when it failed to take off. Van Ryneveld and Brand then used a South African Air Force Airco DH.9 to continue the journey to Cape Town. The South African government awarded them £5,000 each.